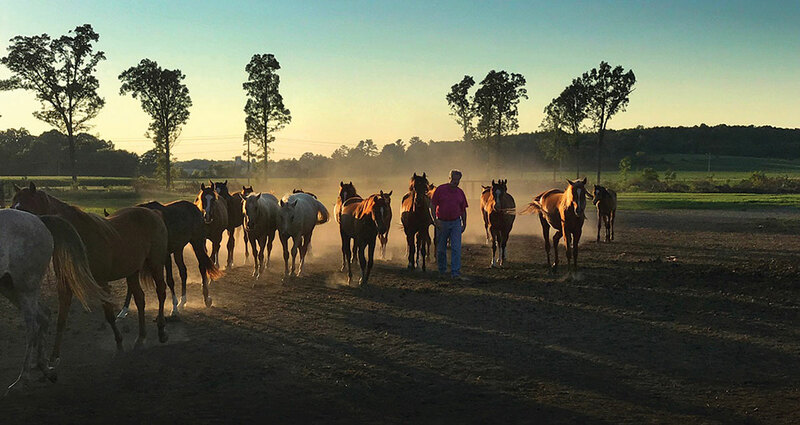 Larry Jerome out with his horses at Jerland Farms in Barron, Wisconsin. 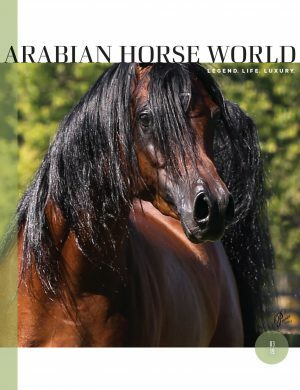 Each month, Arabian Horse World brings you examples of good horsemanship from horsemen and women around the world — tips and lessons that will enhance your life with your Arabian horse. 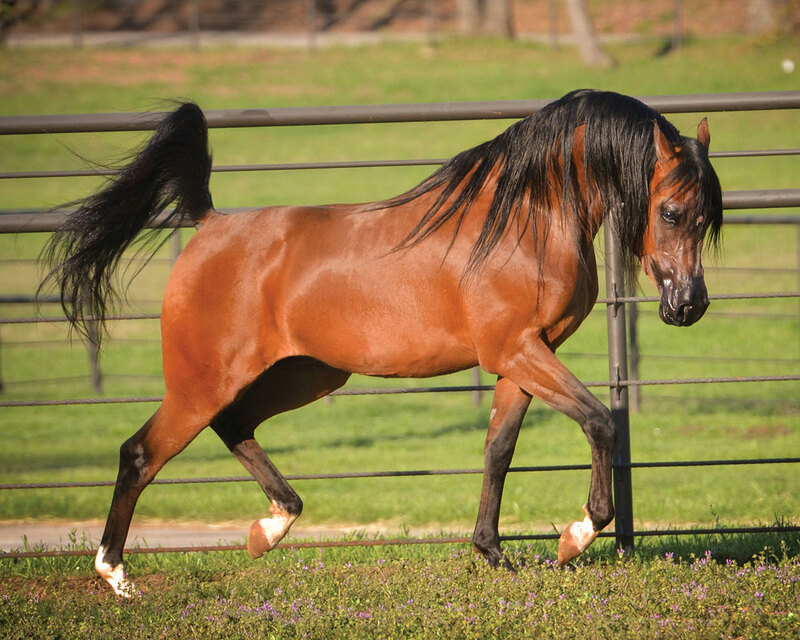 In this installment of the series, we talk with Larry Jerome of Jerland Arabians, Barron, Wisconsin, about raising foals to be good adult horses (see Part 1 of our conversation with Larry in the May 2018 issue, page 32, Part 2 in the June 2018 issue, page 54, and Part 3 in the July 2018 issue, page 52). The first thing that a foal learns from his mother is manners. They will take those social skills with them as they get older. One of the most traumatic things we do with foals is wean them. Separation is a trauma, therefore you must do it in a considerate fashion. We wean them in pairs so that they have a “buddy.” If you put a foal in a solitary situation, the foal seeks attention — it starts nipping, pushing people around, etc. If there is another foal there, they might still nip, but the other foal will nip back, and will not tolerate bad behavior. So the foals correct bad behavior amongst themselves. 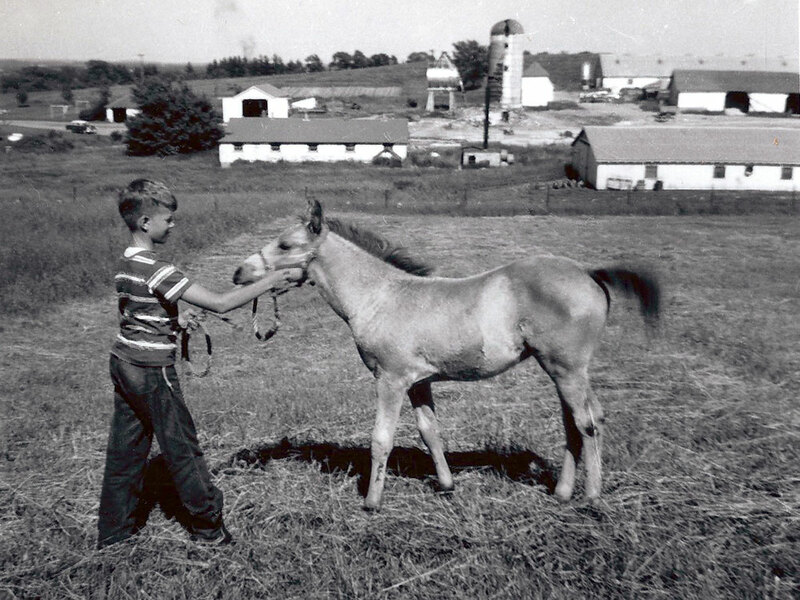 If the foal is solitary and he becomes the most important thing in his world, his behavioral development can be stifled. “All work and no play makes Jack a dull boy” — the same holds true with foals. They need a chance to be a horse, to socialize with other foals, learn herd hierarchy and herd behavior. It works best in big groups, but even two foals interacting is better than a single foal who doesn’t learn from other horses. It is also important to have consistent handlers and handling during the first year of life. The more different people handle the foals, the greater the confusion for the foals. From day one, we turn our foals out with the mare twice per day. The foals learn that human contact is a normal part of their world. Also, it is easier to push around a two-week-old foal than a two-year-old horse. Since all of our broodmares were handled the same way as foals, they trust humans and pass that trusting behavior on to their foals. I love to watch the foals when they are turned out into groups. At first, they run very tight circles around their dams. As time goes on, the circles get wider and wider until the foals intersect and soon the foals are playing together, rearing up and challenging each other. When you deprive them of this type of behavior, you get untrustworthy horses. In the early days after weaning in a group situation, they may not want to come right up to you right away. Therefore, you can make sure that there is a reward for them if they come up to people. For example, at our farm, they get fed and groomed when they come in, so there is some incentive to come in twice per day. I absolutely refuse to chase a horse. It must learn to come when it is called. If it refuses to come up, then I will withhold food or even water until it is very willing to come up to the gate to come in! Since our foals are already halter broken, I don’t have to worry about that aspect of their learning curve. All future changes come about gradually — we don’t want to give them the shock treatment. When they come into a stall at night, we will take their halter off and then put it on them when they go back out. Between the time they are yearlings through their second year, they get caught every day. We don’t do a lot of treats, but there is no harm in giving them carrots or treats to make them more comfortable. What is more important than giving the foals treats is talking or singing to them. I absolutely believe in the grooms singing and talking to the foals at all times. It doesn’t matter if you can’t sing. Sing anyway. Or talk, or tell them stories. But you have to be vocal with the foals the whole time you are working with them. If you go out into to my pastures to see the horses, you can’t see them — because they are on top of you. They are in your pockets — not trotting over the far hillside! The colts and fillies run together until they are about eight months old. If a colt is getting a bit too dominant or a filly is getting a bit too mature, they might get sent to “boys camp” or “girls camp” a bit early. Once they go to camp, they are exposed to everything — milk trucks coming and going, grain deliveries, the radio in the barn, which is on all day long. The hardest thing at this point is getting horses to show off when people come to look for prospects. They just don’t get too excited by much at this stage. Whenever we show someone a horse it is inconvenient, but in a good way. Only one farm has an indoor arena. If the prospect is at the “boy farm,” and a visitor is coming up in, say, March, I have to get the trailer, load up the horse, drive it to the farm with the arena, unload, and get ready. Yes, I could build more arenas, but I keep it inconvenient on purpose — it’s good training. The horses learn at a young age how to load and unload from a trailer, and the guy we have handling our young horses is very confident and very kind. He does not allow a horse to get out of hand. A certain percentage of the population treats their horses like pets. It is like raising kids. We don’t need to be their best friend. We are their parents. We need to set boundaries, but we should also be their safe zone. You must be able to reprimand them, but also have them come back to you. We leave all of our colts intact because it is important to their mental and physical development. Because they are handled every day, they don’t necessarily realize that they are getting bigger, and they don’t challenge the human within the hierarchy. I don’t protect the colts, either. They run with other colts, and they all learn how to sort things out, because they get to be horses, not hothouse flowers. If for some reason they can’t run with other colts, or if someone needs to put manners on a young colt, put him out with a pregnant mare or a gelding. All colts need to be taken down a peg or two once in a while to find out where they stand. It is part of the experience of growing up and also learning to accept their place in the world. Trainers always tell me that they never have problems with my horses as stallions because they have learned how to be around other horses without being obnoxious. 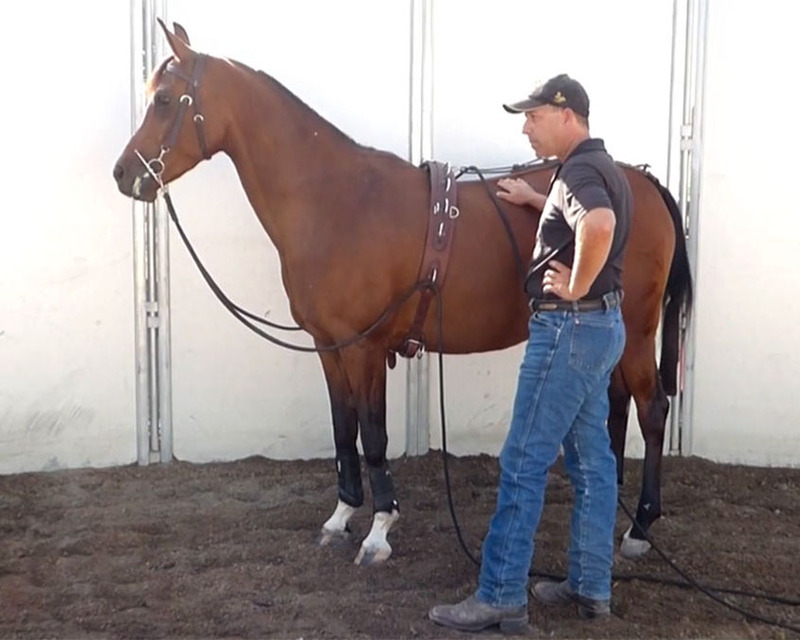 A much bigger problem is a colt that goes into a show barn as a youngster, or one that we get from a show horse facility or other isolated situation. They have never been able to act like a horse. They have been in a “work” situation their whole life. So they either are obnoxious or very shy and reserved. I see horses that are 10 or 11 years old that have never had a break — it does have negative effects. I believe that the fact that our horses live like horses for the first two to three years of life contributes to their great longevity. 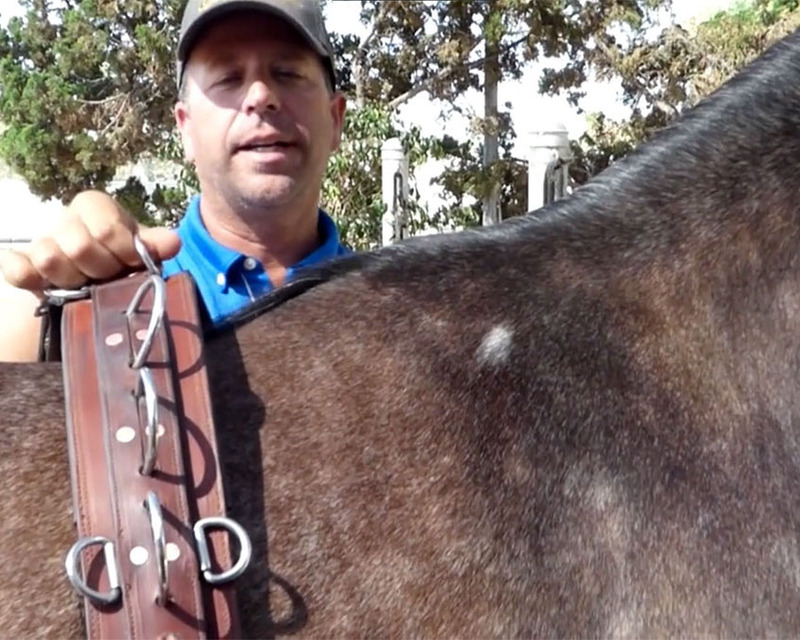 At two years of age we start to think about gelding, longeing, and more handling. As buyers come to look at them for show prospects, I almost have to apologize when I show them our colts because they are usually a bit nicked up from their herd life! The yearlings and two-year-olds run together. The yearlings have it a bit rougher, as the older colts rule the roost, but the following year, the yearlings are kings of the castle and the new yearlings are their minions. This type of life builds mental and physical maturity. Rearing, bucking, running — you need all of that to build lean muscle. It is so important that they get out and just grow. By keeping them in and keeping shoes on them, their feet don’t grow properly. I want good feet on my horses. I am not an “animal rights” person, I am an “animal welfare” person. Our job is to be caretakers of these horses. For example, when you treat dogs, for example, like people, making excuses for their behavior, that’s when someone gets bitten. If you make excuses for your horse’s behavior rather than correcting it, there will be a problem. When intact colts live and run and play and fight outside, I end up with horses that are better performance prospects. I have a horse that feels good about himself. Vets regularly have owners neuter dogs early because of bad behavior. It is not the testicles that are causing the bad behavior, it is a lack of discipline and boundaries. Remember two words: common sense. I tell my clients they can always call and ask me questions, but I will tell them to think about those two words. Chances are you already know the answer to your question. The connection starts when they are born and goes to two years of age when they go to “college.” What you do in those first two years makes all the difference for you, your horse, and the trainers.